40% softer than leading competitor fluorocarbon lines. 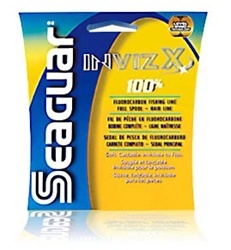 A soft, supple and more castable line, InvizX can be used in both Spinning Reels and Bait Casting Reels. The line is strong yet sensitive and offers advanced hook setting power and knot strength. Suitable for both fresh water and salt water. As with all 100% Fluorocarbon products, InvizX is much less visible underwater than monofilament line and virtually invisible to fish. InvizX is also UV resistant, chemical resistant, non-absorbant, high-density and impervious to cold conditions.